On my way home from the air show conference I decided to stop in Buffalo, New York. During a stop at the Walden Galleria shopping mall I noticed the pictured advertisement. 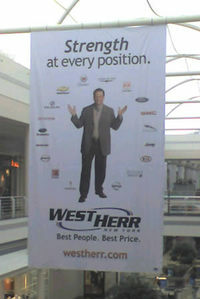 It is a large indoor banner advertisement hanging in the middle of the mall. The banner ad is a decent example of web centric marketing. It has a few elements that help it stand out from most of the other advertisements I viewed. It was the largest advertisement in the mall. Because of its size it was difficult not to notice. Regardless of size it was positioned in a good location, right in the middle of a high traffic area. Your almost forced to look at it because of size and position. I doubt anyone goes to the mall with the intent of purchasing a new or used car. But, shoppers might have the notion of needing to make a car purchase before or after visiting the mall. The headline, which is arguably the most important element of any advertisement, is at the top. The person who I believe is the owner of the auto dealership is the person pictured. The individual pictured is also the dominate element of the advertisement. This draws attention. Around the person are a series of various car company logos. Below the picture and logos is the company's logo and associated tag line. This component establishes brand awareness. If you are interested in learning more about what West Herr has to offer they give you a web address. The address is the smallest sized font on the advertisement, but it does stand out. If someone is interested in more information, they can visit the web site. The key to web centric marketing is getting people to come to your web site to find out additional information.